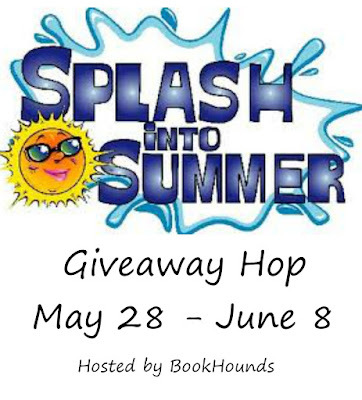 Welcome to Splash Into Summer Giveaway Hop! Our stop is $25 Amazon Gift Card or $20 Visa Gift Card! Then check out what the others below have to offer! As for me, I'm heading to the pool!! I'm a big fan of signed books, but gift cards are great since I can use them for whatever I want or need. Thanks! I love to win gift cards, then I can buy more ebooks. Signed books are great, but I'm running out of bookshelves! I like to win books and gift cards! I love to win gift cards !!! I love gift cards then I can get them when and how I want! Gift cards, or books that I want to read. Book or gift cards for books. I love to win gift cards when I enter giveaways! I love to win books but I love love to win gift cards as well because then I can buy books! I like to win gift cards! I like to win gift cards, electronics like cameras or video game consoles or Nintendo video games. I love to win gift cards and books! Giftcards are my main objective to win. I like to win cash, books and Amazon gift cards. I like ebooks and gift cards (to buy more ebooks)! Gift card or a book of the winners choosing! I like to win money, honey. I like to win gift cards and books. I like to win books, gift cards or DVD's. I like to win books or amazon gift cards to buy books. Books, swag & gift cards are always great thank you. I like a little bit of everything. Books, gift cards, book swags, trinkets and other goodies are all loved. Books! Or gift cards to buy books! I like to win gift cards and coffee & tea to drink while I read the books I win! I like to win cash or gift cards. I like to win Amazon GCs. I can always use gift cards or Paypal cash! Gift cards of almost any type. I always love to win books. I love holding them in my hands and reading them. Thank you. I love when blogs have books chosen out and where you can choose which book it is you want from their selection and of course, gift cards are always nice for a book you've maybe been wanting for a while now! I like to win books, gift cards, kitchen items, bath items, just about anything! I love to win books! I like to enter gift cards as then I can choose the book/books that I want. Amazon or paypal gift cards! I love to win books. I give them to the library when I'm finished reading. I also love to win chocolate. I like winning books, gift cards or craft supplies. My favorite thing to win is paypal cash when I enter giveaways. I love to win gift certificates. That way I can choose the book I want to read. Thanks for your giveaway. Hope you have a good summer filled with lots of good books. My favorite is the gift cards. Gift cards so I can buy the book I want. I love to win books, gift cards. I like gift cards or books of my choice. I like to win gift cards and physical copies of books. Thanks for participating in the hop! I love to win gift cards or E books. I love gift cards, food items, and games for my sons! Books and giftcards. Thanks for the chance! I love to win gift cards! I love winning Amazon gift cards and signed books. I love to win GCs, and ebooks. I love to win Amazon, PayPal or Walmart gift cards most of all! I like to win books or audio books that are on my list, and I love Amazon gift cards, so I can buy some of those books. I love to win gift cards. I like to win beauty products, visa, amazon, paypal gift cards, trips, and electronic gadgets. I like to win Paypal cash because it is so versatile. I like gift cards, books and Paypal cash. Gift cards, cash, and various products related to good health are some of my favorites. I love to win stuff for my children. I like to win gift cards or electronics. I love to win gift cards and paypal cash in giveaways. I like to win giftcards! Gift cards are great, and books are always welcome! I like to win Gift Cards,Cash,books,DVDs and electronics! Thank you!! I like the PayPal cash and Amazon gift cards the most of all prizes when it comes to entering giveaways. I love to win books, gift cards and jewelry. I love to win gift cards but books are always a great prize too! Gift cards, DVDs and toys are always good things to win!